A swollen eye can be bothersome for a number of reasons. Many times the swollen eye is sensitive to both light and touch. It may be so swollen that you cannot even open it, which not only feels uncomfortable, it means you only have fifty-percent of your normal vision. Usually a swollen eye looks puffy and red, which can be embarrassing in public. There are many causes for a swollen eye. The most obvious is when your eye has been injured. This kind of trauma might be caused by an accident, such as an automobile collision, falling down stairs or onto the ground, running into something, such as a door or the edge of a cupboard, or from a fight, where someone has hit you in the eye. In all of these cases, you know the cause of the swelling and it is just a matter of icing the eye and not overusing it until the swelling goes down and the injury has had time to heal. If anything inside of the eye itself seems damaged, such as a scratch on the lens, the presence of a foreign object, or it just feels like something is in there, you should go to an immediate care center or hospital emergency room and have it checked out by a doctor. If you just wake up one morning with a swollen eye and nothing out of the ordinary has happened to cause an injury, you are most apt to have a case of conjunctivitis. When this is the case, the symptoms are usually a swollen eye that is red, painful, itchy, watering, or feels sticky. The conjunctiva is the name for the membrane lining of the eye. Conjunctivitis can affect one of your eyes or both of them. It is necessary to seek treatment if you have this condition. Failure to do so can result in permanent eye damage. There are four different types of conjunctivitis which can cause a swollen eye or eyes--those caused by allergies, an autoimmune system response, irritation, or infection. Allergic conjunctivitis is the most common of all eye conditions. That’s because it can be caused by literally hundreds of different kinds allergies. Possible causes can include dust, pollen, animals, contact lens drops, make-up, and many others. If possible, you will need to avoid whatever substance or object to which you are allergic and treat with antihistamines. Eye problems that are the result of an autoimmune system response can be attributed to many different types of diseases. For instance, someone with inflammatory bowel disease or rheumatoid arthritis can have red and swollen eyes because a genetic link can cause the body to make antibodies to target the eyes. It is often treated with prescribed corticosteroids. Conjunctivitis can be caused by irritations to the eye. These can be somewhat common, such as working in front of a computer screen for too long, being in an environment where people are smoking, or even swimming in a pool that has been treated with chlorine. You could have a piece of glass in the eye or the wind could have blown in a spec of dirt. Some people who work around machines or automobiles can even have a sliver of metal get carried into the eye. In these cases, it will be necessary to have a doctor remove the object, irrigate with saline and prescribe some special eye drops to heal the injury. You might have to cover the eye so it is not exposed to air and light while it is healing. The final type of conjunctivitis which can cause a swollen eye is caused by infection. It can be bacterial or viral. 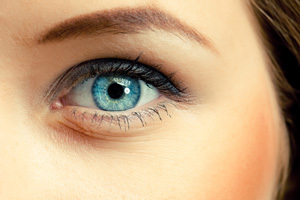 Depending on the diagnosis, you might need to get prescription eye drops or even antibiotics. Bacterial infections can be caused by streptococci, staphylococci or haemophilus. Herpes simplex virus can cause eye infections as can Chlamydia, an infection spread by sexual contact. The eyes are very sensitive and it doesn’t take much to cause permanent damage. So, if you have a swollen eye or any other symptoms involving the eye, don’t wait for it to go away--see a doctor or seek emergency medical treatment as soon as you can.